So let’s start with the videos where I talked to the Greeks, after two weeks of living in their country, seeing their fabulous rivers and archeological sacred sites, cruising by their cities and marvelling at the little differences, good and bad. There are two talks here: one from the Athens Hackerspace, and one at Free and Real‘s Telaithrion Project. Both of these groups embody, at root, the possible structural solutions to the problems which plague Greece and the rest of the world: the reunification of Production and Consumption in an environment of global justice. As it was a special occasion, for a brief while, I wheeled out The Big Gun (Dark Mountain 2010), and talked about the poor and the transformation of the world as the internet pours into the villages. But that was in a context where Greeks are already returning to their villages, albeit to drink coffee and see relatives and wait for Athens to provide jobs so they can leave home again, rather than to farm. The prospect that the jobs will not come back crosses nobody’s mind: The Problem is the politicians, or the Germans, not the global supply chain which provided a boom for us at the cost of a permanent bust for those unlucky enough to live in “permacollapse” (permanent collapse) countries like most of Africa, or designated regions such as rural India. We also talked about the Chinese fascism embedded in all of our technological artifacts, the oppression of Chinese workers in an environment which bans unionization because you have the Communist Party for that, and the poor miners who slave away in Hell for dollars a day to harvest minerals for our 3G modems and cell phones. Free Software talks about the freedom of users, as in Stallman’s Four Freedoms. Free Hardware must talk about the freedom of everybody involved in the supply chain, not simply the freedom of end users. In Greece, they are no closer to the cliff and the fall than we are, the only difference is that they can see it. And here’s the talk I did at Free and Real, a rural and off-grid community high on the mountainous coasts, a four or five hour drive on twisting country lanes from Athens. There we were talking about the deep practicality of living in the hills, on your own infrastructure, on your own land, your own tools, your own resource. Amazing to deliver the theory to people living the practice, and to find that it aided, illuminated and made sense. I was delighted. You can download the talks here. For some reason, Greeks love Gridbeam as a concept for furniture etc. ResilienceMaps.org is the new home for Simple Critical Infrastructure Maps, the mapping technology with all the grids you’ll see in the videos. ResilienceDesigner.com comes up a couple of times – four new careers waiting for resilience activists. Hexayurt.com is the Hexayurt Project site, again with many examples in the videos. I used Razi Masri‘s visuals a lot in all three talks! 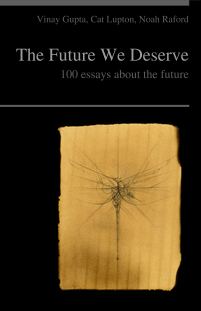 The Future We Deserve is our collaborative futures book – you’ll love it! And finally, this is me and this is an index of my work. I hope you’ll find that useful.